Knowing the price of progress is trouble--you can't blame a well-oiled machine such as NASCAR for not dropping a computerized monkey wrench into the Winston Cup clockworks. Fender-rubbing excitement is NASCAR's product and you don't need computerized engines to do that. You don't need overhead cams either. In fact, you don't need anything Dearborn sells to have a good race, as suggested by the recent talk of going to generic bodywork and simply applying Ford grille and headlight decals to tell Taurii from the rest of the herd. Horse Sense: Robert Yates Racing Engines' latest shop is new, clean, andboasts a lobby the size of a small house. But it's a racing shop, nomatter the tile, carpet, plants, trendy black furniture, andreceptionist. As soon as you walk in the door, the racer's perfume ofwarm racing oil washes over you. It's incongruous at first, this smellof racing engines in what resembles a hotel lobby, but in the WinstonCup world of Moorseville, North Carolina, it's the norm. Because you consider auto racing more than costume wrestling, we wager you feel differently than the marketing majors at the sanctioning bodies. Should a Ford get into the winner's circle, you--and we--would like it to be sufficiently a Ford to matter. So would Robert Yates, and to that end he's warming his wrenches and technicians on what will inevitably be the next Winston Cup engine, the electronically fuel-injected Four-Valve V-8. 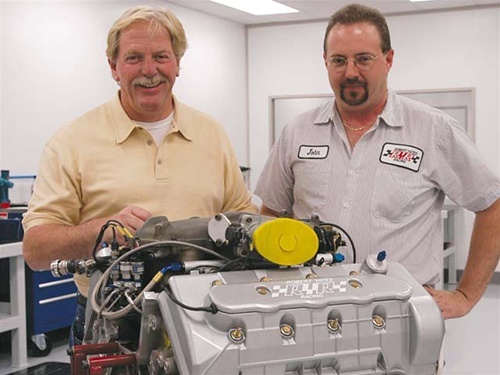 Seeing how the pushrod-and-carbureted Yates shop was working on a paradigm-shifting development such as the overhead cam, multivalve, EFI modular engine, we packed the camera and headed to Robert Yates Racing Engines to investigate what these powerplant experts were up to. The vehicle for the Yates Racing Engines modular program is the Multimatic Ford Focus Daytona Prototype. This car runs in the new Daytona Prototype class sanctioned by GrandAm, the sports carracing arm of NASCAR. Envisioned as a cost-contained prototype similar to those traditionally running at the Daytona 24 Hours, Le Mans, Sebring, and other sports car classics but for less money, Daytona Prototypes are supposed to resemble their namesake cars by using stock head and taillamp assemblies and other trim parts. Still, you really have to squint to get even a hint of an SVT Focus when gandering at the low, voluptuous bodywork of the Multimatic Daytona Prototype. GrandAm mandates the proto- types not use the engine as a stressed member of the chassis, so the car must be able to roll across the tech shed floor without the engine in the car. Also, GrandAm wants only limited horsepower in the prototypes, to the point where they told the interested manufacturers to submit engines to the sanc-tioning body with 500 hp and 400 lb-ft of torque using a 7,000-rpm redline. These engines were dyno tested to verify the power, then torn down by GrandAm for an internal inspection, followed by issuance of a specific rules package for each manufacturer. Among others, BMW, Chevrolet, Ford, Porsche, and Toyota are participating. Specifics to the Four-Valve 4.6/5.0 Ford modular engine are a modest 0.500-inch valve lift limitation and no more than five speeds in the transaxle. The Ford redline remains at 7,000 rpm, while some of the smaller engines in the class were allowed higher redlines and six-speed transmissions. It's worth noting that at the only race run by our deadline--the 24 Hours of Daytona--the Daytona Prototypes were all barely competitive with the lower GTS and GT3 classes. In fact, the overall race win was taken by a GT-3 Porsche (a modified 911), and clearly we expect GrandAm to free up the prototype engine rules some before too long. While we know Robert Yates is personally interested in promoting the modular engine for Winston Cup, no one expects him to tilt at the NASCAR windmill using nothing but his own development money. Enter Ford supplier Multimatic, which wanted to play on the big stage with its own chassis but needed an engine, and Dan Davis, head of Ford Racing Performance Parts, who has wanted to develop the Four-Valve modular V-8 into a racing engine for years now. With Yates already making Davis' engine parts look good in Winston Cup on a weekly basis, it's not difficult to imagine a short conversation between them to get a limited modular engine development program run- ning and on-track via Multimatic. We assume some help from Ford in the way of parts, information, and limited funds was put forward, but as this is mainly a Multimatic/RYR Engines show, we doubt there is significant Ford money changing hands. At RYR Engines, Jon Giles, not incidentally late of FRPP, was hired as liaison with the company and its modular specialists, such as engineer Andy Schwartz. While he was hiring, Operations Manager Mark McCardle at RYR Engines also brought in John Maddox to serve as the Head Engine Builder, Special Projects, and spearhead the hands-on development of the Daytona Prototype engine. Working with John is Robert "Bob" Boahbedason (known around the shop as "Bobbydawson" or "Double Bob") to be the Special Projects Cylinder Head Technician on the modular program. From a daily, hands-on basis, it's John and Robert putting in the hours on the modular program. At one level, it's scary how stock the Yates modular engine is. The block, heads, and intake are all FR500 parts. These are limited-run performance Four-Valve V-8 engine bits originally seen on FRPP's three FR500 Mustang development cars a few years ago and now mainly available through the company's catalog. To these basics Yates adds its own dry-sump oiling system; a modi-fied front engine dress to accommodate the engine mounting and accessory packaging required by the Multimatic chassis; a small amount of port work for increased airflow and power--it isn't difficult to get 500 hp with Four-Valve airflow--along with seat and guide changes for 24-hour racing durability; custom camshafts for power; custom cranks, rods, and pistons for durability; and, of course, numerous detail changes for midengine mounting, ease of maintenance, and so on. So, on another level, the engine looks considerably different from what's under the hood of your Mustang Cobra, and indeed there are few identical parts between a stock Mustang Cobra and the Yates Four-Valves. By the time all the massaging and bulletproof parts go in, the finished product is far from production. Yet stock and Yates Four-Valves are remarkably similar engines, much more so than the small-blocks in Winston Cup are to 5.0s, or 5.0s are to anything racing for money at the World Ford Challenge. To get its engine program running immediately and to avoid wearing out their expensive, hand-built-prototype and rare Ford-supplied parts, RYR Engines bought a Sean Hyland Motorsport Four-Valve 5.0 to use as a dyno mule and test bed. The only modifica-tion to the basic SHM package was going from the SHM copper gasket and O-ring head sealing to a shim gasket because of water leaks. This stock production-based engine is still being used for parts development work at RYR Engines. For the eight RYR Four-Valve engines built so far (two development engines, four race engines, and two Panoz Esperante race engines--they're another story), RYR is using aluminum, 94mm bore, steel-capped FR500 blocks from the original run of these blocks. These CM-6010-D50 blocks are not in the FRPP catalog, and apparently you really don't want one anyway. Originally spray-bore 5.0 units, these blocks have had the spray-bore (a neat idea that unfortunately hasn't worked) machined out and liners installed--all these blocks break in the water jacket, leaking coolant into the head bolt bosses. John has his tricks to make these early, essentially first-run prototype blocks live, but like everyone else around high-zoot modulars, he was waiting until May 2003 for "production" FR500 blocks from Ford. These improved units are being built in production Ford facilities, foundries, and machining lines and won't have any coolant issues. John adds ARP main and head studs to the blocks. Admittedly, this is partially a "just because" move on his part, seeing how the stock fasteners work quite well at 500 hp. However, the OEM head bolt is a stretch-to-yield fastener, and because these engines are regularly torn down and reassembled for servicing, that would have meant buying head studs by the carload. Hence the ARP studs. "We went over the top on this engine to run 24 hours...," John says, "[later] we'll be bringing the level of parts down to meet the realities." Head gaskets are multilayer, stainless-steel-shim-style from Cometic. With these, John is trying something new as a guinea pig for the Winston Cup engine shop. He says the sports-car racing makes a great 24-hour durability test, and he's found the Cometic gasket's beading works quite well. Another place the stock engine works great but is nevertheless highly modified is oiling. To lower the engine in the chassis for an improved center of gravity (the crankshaft centerline is only 43/4 inches above the pavement), reduce windage and thus increase horsepower, and provide significantly more oil capacity to reduce the number of trips each oil molecule makes through the engine in 24 hours, a dry-sump system replaces the stock wet-sump design. Aside from simply removing the stock oil pump, all the changes are either in the oil pan or externally in the RYR pump, lines, tanks, and so on. In other words, the internal oil passages are left stock, and oil flow to the top of the engine is not restricted "We're not that smart yet," John says. Initially, the timing chains gave John fits--he was melting chain guides. The cure is what he's using now, stock chains from manual-transmission Cobra engines. Yes, there are automatic- and standard-transmission chains, something John didn't know until a few days before the 24-hour Daytona race. He was getting donor parts from all sorts of sources at FoMoCo--some from Marauders, some from regular Cobra engines, and probably even the odd Navigator piece. It turns out the Cobra chain is polished on the backside where it rubs against the guides and tensioners so it doesn't wear them out at high rpm. The tensioners are the same in all engines, and the Yates engines use stone-stock tensioners. The cam sprockets started off as modified stockers at the Daytona race, with John working on custom RYR sprockets for future engines. The only issue is cam adjustability--he needs a finely adjustable sprocket for precisely dialing in the cams. So far, John has tried cams from Andy Schwartz's experimental pile, along with a Comp Cams grind. All the specifics are confidential, naturally. "Just call it a 12.5mm cam," says John, who went on to say there was nothing too radical and the result was a huge, flat torque curve. As are the chains, much of the rest of the valvetrain is stock, including the finger followers and hydraulic lash adjusters. The girdled cam bearing caps have to be modified for clearance with the large lobes. "Nothing a hacksaw won't take care of," John says. Also surprisingly stock is the cooling system, including the water pump. An air pocket forms in the cylinder heads during the coolant fill, according to John, and his cure is to drill an orifice between the outside water jacket and the cylinder head, across the top side of the exhaust seats to discharge the air pocket behind the exhaust seat. "If you could stand the engine up when filling it, this would not be an issue," he says. Engine management is a speed- density design from EFI Technology, a respected system in professional racing circles. John says its Windows-based software is user-friendly, and it's self-learning from Lambda input (closed loop). It can apply its closed-loop memory to the default programming map, if desired, so it helps write its own software, if you will. Durability was the goal in prepping the heads. The guides were allknocked out and replaced with Yates-spec bronze pieces, and the exhaustseats were replaced with Tucker Engineering chrome steel inserts. Thestock intake seat is retained. Here we see a head in the middle of thevalve job. This work also allows Robert to locate the valve centerlineand seat concentricity to his specifications. The ignition is stock Mercury Marauder coil-on-plug "or whatever we can get our hands on." That's another way of saying most of the late-model coil-on-plug Ford ignitions are the same, so a Cobra ignition would be the same thing. Bosch spark plugs and stock '03 supercharged Mustang Cobra injectors are used. Another stock part is the half-speed, or cam-position, sensor. The crank trigger is a modified SHM or billet RYR part depending on the engine. The stainless steel 4-2-1 headers are from Burns Stainless Exhaust. The only issue was going a bit wide to clear the external oil pump. By our deadline, the single Multimatic Motorsports car fielded had only run the Daytona 24 Hours, finishing Fourth overall and First in class. A minor problem kept the team from the overall win, so the trend seems positive. Indeed, the indications point to a powerful, durable sports car engine from the modular family. FRPP has to be pleased to finally have the Four-Valve step up to big-time racing and begin what will certainly be decades of development. When will it become the Winston Cup engine? "The day the manufacturers insist on it," Robert Yates says. "They would have to all walk in the door and say unanimously, 'We want it,' and then it would happen in a couple of years. You could take it to the restrictor tracks first, and help bring it along.... I think we'll see it in the next five years. It really is up to Detroit." Winston Cup rumors say Toyota is currently providing the technology push. It's already announced its NASCAR race truck, and word is Toyota's goal is Winston Cup in 2007, with fuel injection. It's all part of a plan to win everything that runs at the Indianapolis Motor Speedway, according to the buzz.